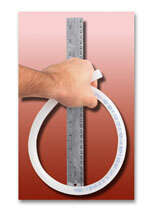 The minimum acceptable bending radius in accordance with ASTM F 877 is 6 times the tubing outside diameter. Due to the unique flexibility of ThermaPEX® Tubing - as compared to conventional PEX tubing, we allow a bending radius of 4 times the outside diameter. The outside diameter is equal to the nominal size plus 1/8". Below table is a comparision of minimum bending radii of PEX in accordance with ASTM and bending radii of ThermaPEX® Tubing. There is also a listing of the corresponding center distances when exiting the bend. Note that the actual center distances of the tubing in a radiant floor heating layout can be made somewhat narrower by allowing a so called "pear shaped" bend. ThermaPEX® Tubing is manufactured in accordance with ASTM F 876. See details of the specification, below. Our control of measurements is second to none. Measurements are supervised by NSF International 4 times per year.